Jimmy Fallon Campaign – Week Three! I hope you’re having a lovely day and are keeping warmer than I am. It’s downright chilly in Portland. And drat to the elephant in the room. Making this week’s installment of my campaign to be a guest on Late Night with Jimmy Fallon was more arduous than expected, complete with a small artistic meltdown (What am I doing?) and multiple upload failures (Aw snap!). Whew! Glad that’s over. My apologies for the long delay. As for the content, I celebrate the crazy vault of song lyrics located in my head without exposing your delicate senses to my untrained voice. Maybe music lessons are in my future. What say you, crystal ball? After my appearance on Jimmy Fallon? Hot damn! 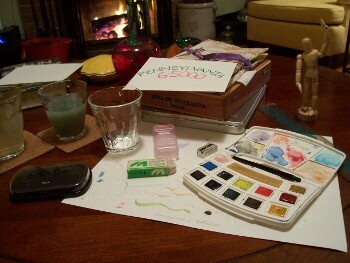 Anyhoo, the watercolors, just in case you’re wondering, save the aeroplane (a favorite rubber stamp), are all mine. Not bad for a beginner, if I do say so myself. Watercolor J.F. here (and looking pretty good I must say, albeit a might pale) with a message from my maker. Due to technical difficulties, Week Three of Colleen’s Campaign to be a guest on Late Night with Jimmy Fallon will be delayed. Tune in tomorrow. Same bat-time! Same bat-station! I’ve got a slightly spooky film just in time for Halloween. I know, so very un-Colleen-like. I’ll admit, too, that I was a tad worried when the hubster and I started watching this. It was after dark, and my writer’s mind was darting hither and yon with what might happen, but, quite thankfully, I talked myself out of being frightened, save when called for, and thoroughly enjoyed the show. I was rather proud of myself, indeed. No scary dreams, either, double yum! Anyway, to the film – Michael Farr (Ciaran Hinds) is a slightly lonely and depressed widower, living in a gorgeous home in a small seaside Irish town with his two children. He also writes a little on the side and helps out at the annual writers festival. As the festival gets in full swing, he finds himself aware of a frightening, yet familiar, presence in his home, accompanied by thuds in the dark, knocking on doors, and shadows where there shouldn’t be. Rather serendipitously, one of the authors under his charge (Iben Hjejle) has written about the appearance of spirits and ghosts, and as their relationship grows more friendly, he decides to relate his increasingly disturbing experiences to her. Unfortunately, he is perpetually interrupted by a rather boorish and hopelessly arrogant writer (Aidan Quinn) whose sole purpose for appearing at the festival is to declare his love for her. Drat! 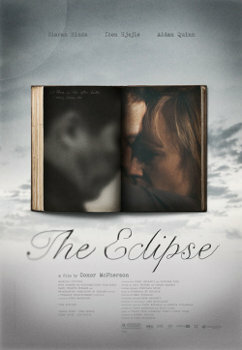 Beautifully filmed in an utterly gorgeous setting, it is a great tale of loss, mourning, and hope. There’s also occasion for laughter and fright, of course. Truth be told, I screamed once – though, in my defense, it wasn’t terribly loud. The soundtrack is rather fine, as well.